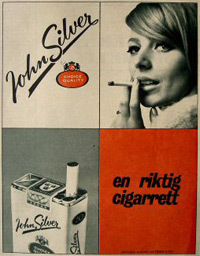 Huge collection of Swedish cigarette brand John Silver-products at this gallery site. Ashtrays, adverts, packages etc from the start of production 1947. Please note: cigarettes are bad for you – cool brand names and package design isn’t.